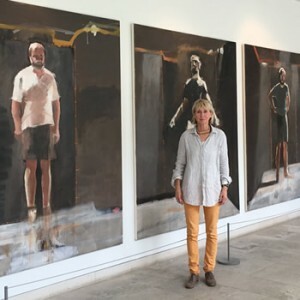 A triptych of large-scale paintings by artist Pippa Blake will go on display at Pallant House Gallery this spring following her time as Artist in Residence at Chichester Festival Theatre in 2015.
at Chichester’s Minerva Theatre in the autumn. The focus of Pippa Blake’s second residency at the theatre, ‘Someone Who’ll Watch Over Me’ was inspired by the experiences of those taken hostage in Lebanon in the 1980s and explores the bonds forged through shared adversity by three prisoners: Adam, an American doctor, Edward, an Irish journalist and Michael, an English academic. A powerful testimony to the resilience of the human spirit, the play was directed by Michael Attenborough CBE. The cast was David Haig, Rory Keenan and Adam Rayner. Blake’s first residency at Chichester Festival Theatre was in 2014 when she focused on Richard Bean’s play ‘Pitcairn’ about the colonizing of a South Pacific island in 1789. The residency marked the first time the artist had used theatre as a starting point for her work, exploring the visuals, atmosphere and psychology of a play. 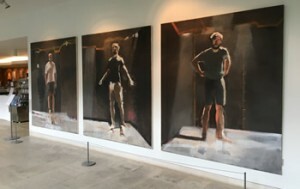 The resulting paintings were exhibited in London and at West Dean College. Pippa Blake: Someone Who’ll Watch Over Me will be on display in the Garden Gallery at Pallant House Gallery from 10 May until 19 June 2016. Entry to the Garden Gallery is free.